Supporters of Kenya’s opposition coalition, NASA on Tuesday flocked the capital, Nairobi and its strongholds, to demand for resignation of electoral body officials, ahead of the 26 October fresh presidential elections. 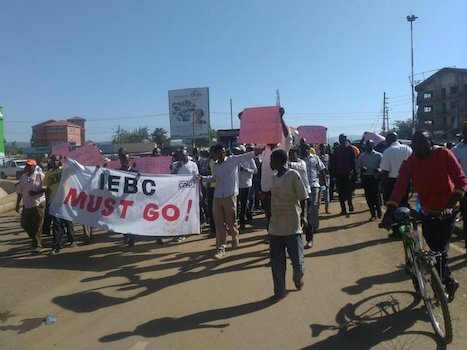 NASA supporters were demanding resignation of Ezra Chiloba, the C.E.O of the Independent Electoral and Boundaries Commission (IEBC), and other 10 including the suspended Head of ICT James Muhati. They are accused by the opposition of being behind the “irregularities and illegalities” of the annulled August 8 elections. NASA’s flag bearer, Raila Odinga, last week, released names of 12 individuals to be replaced if elections are to be held. The demonstrations are also in defiance of IEBC’s request on Monday, to cancel them as the body has arranged a consultative meeting on Wednesday to fix the issues. President Uhuru’s jubilee party has condemned the opposition’s claims, urging them to allow IEBC to its work to prepare for the 26 October elections.